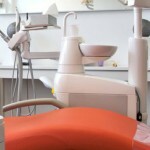 Denturist in Toronto - Why Choose Dentures Direct? Whether you have dentures that have become old and outdated…are suffering from the effects of tooth loss and not sure what to do about it…or need your current dentures fixed ASAP…how can you know which denturist in Toronto to visit? If you purchased your dentures from a clinic that you love and trust, the decision is easy. But if you suspect that you could get a better price, better service, or better quality product elsewhere, there is a great alternative to searching the Yellow Pages and the internet: Dentures Direct. In an era where almost everything is outsourced, there are some things which, refreshingly, are simply more cost-effective to do in-house. 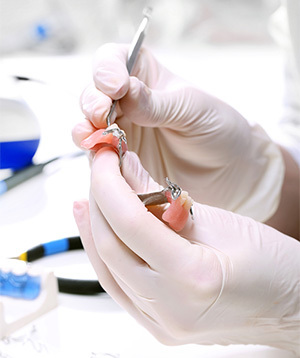 Crafting custom dentures and implants and performing denture repairs, are two of those things. 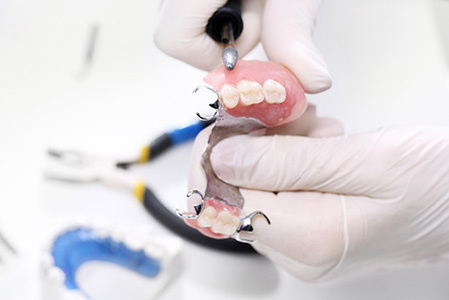 Because Dentures Direct has an on-site lab that is fully equipped with the most modern equipment and materials, we can perform all our work right on the premises. For you, that means factory direct pricing that few clinics can compete with. Another benefit of having all our denture services under roof is that you don’t have to run around to a second location. After your dental exam and any tests or surgeries that might be required, you pick up your new teeth from the same convenient location – with a much shorter wait time than if your custom teeth were being made somewhere else. And if the lab has any questions, they can simply ask the denturist who did your exam; no phone tag or crossed wires, just clear, face-to-face communication. Implant supported dentures…partial dentures…non-removable permanent dentures…even immediate dentures – whatever your denture needs, Dentures Direct can help. We offer a full range of denture services so you don’t have to go anywhere else, whether you need a single replacement tooth or a full set of new teeth. If your current denture breaks or becomes uncomfortable, we can perform professional denture repairs in about an hour! 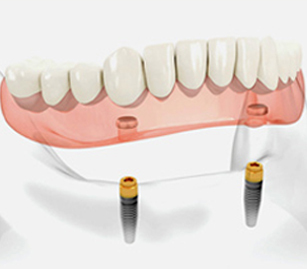 Dentures Direct uses the patented “All-on-4” technique for dental implants. This incredible technology makes denture implants available even to patients who have suffered significant bone loss in the jaw after the loss of their natural teeth. 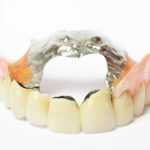 Because all the new teeth sit on only four implants, most patients have enough viable bone to support the new denture. Many more testimonials attest to the great service, affordable pricing, and comfortably fitting, attractive dentures that clients are enjoying every day at Dentures Direct – YOUR Toronto denturist! Discover the Dentures Direct difference for yourself by calling us at 416 245 7474 for an appointment today!